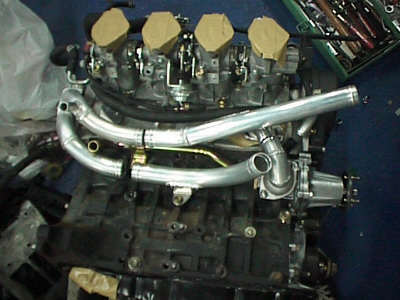 Introduction: The 20 valve version of the 4A-GE engine appeared on the 1992 Corolla Levin and Sprinter Trueno in Japan. Most notable feature of this new 4A-GE at the time was the use of 3 valves per cylinder on the intake side, making a total of 5 valves per cylinder. The new engine also featured individual throttle bodies which consisted of 4 throttles feeding each cylinder independently. This feature improved response and torque and as a side effect, produced a nice full throttle sounds rivaling best of the carbureted setups. Another new technology introduced with the 20 valve engines was the VVT, or variable valve timing. The intake cam timing changed for more stable torque delivery at middle rev ranges and allowed use of more aggressive factory specification cams without loss of drivability. The conversion placement in an AE86 however, is an involved task due to many concerns addressed in this page. We will examine each step briefly so I can perhaps assist those contemplating in the process or in the middle of the whole scheme. This chapter will apply to both the first generation 20V, "silver top" AE101 version and the newer 1995~AE111 "blacktop" editions. Wire harness or at least all sockets for sensors and 20V ECU. Throttle cable from left hand drive AE86 without cruise control. Cutting the firewall/bulkhead for clearing the distributor location OR.. Using a DLI with aftermarket ECU or ignition system at major expense. USA (left hand drive) AE86 can be easily fitted with custom / generic hoses and pipes routed from rear of the engine over the exhaust manifold, difference being the nature of where the heater core is situated in relation to the tight space between the firewall and engine. Placement of the engine: The 20V's head design has been completely re-worked. 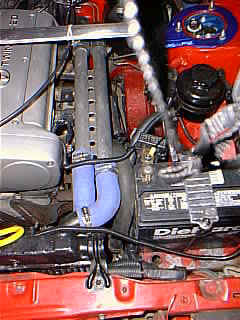 Because there were no plans by Toyota to install it in a longitudinal orientation (RWD), as in an AE86 format, the following factors are apparent problems: When careful measurements have provided your engine with pieces needed for the engine to clear the firewall, the installation is simple. Since the block design have stayed the same, the 20V should bolt right into the 16V's mounts and all accessories needed will fit also. Easiest way to accommodate the AE86's accessories is to use the AE86 crank pulley, shaved at the base by 2mm to align the belts. 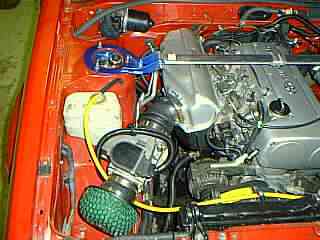 By this method, all the AE86 equipment from the 16V engine such as A/C, alternator, and power steering can be used. On the AE101 models, an air-flow meter (AFM) is used so the intake plenum has to be modified or fabricated to seal the throttle bodies back to the AFM device. The AE111 models have no problem here as vacuum sensor (MAP) device was used and can be operated with open throttle body. Using the Full 20V distributor (recommended) but requires cutting the firewall. Sensors and Vacuum Lines: After deciding on the configuration and the water line problem has been solved, next step will be wiring the engine and peripherals. There are many sensors in the 20V, most of which have to be properly connected to give correct readings and feedback to the ECU. See the following photos to get an idea of all sensors and it's locations. (Above) Clockwise from the top: Brake Booster Vacuum at #4 cylinder, Dashpot Vacuum, Fuel Return (near #1), Remove bracket under #4, ISCV Valve intake, Fuel Delivery input pipe. The Cooling System: First, the water lines through the engine has been altered for the 20V and flows through the pump to the head, then to the block then out to the radiator. The inlet and outlet for the water is in the rear of the block and poses a big concern for AE86 application. The water outlet has to be modified and pipes run from the rear to the front to the radiator and back. (see figure 1). When fabricating the water system, it is important to remember that water should run to the head first and not the block from the radiator flow. A common setup has the water taken from the water pump to the radiator direct but this setup will provide the cold water to the block first, thereby running the head at higher than normal temperatures. This causes variances in water temp readings and will cause the ECU to give inaccurate fuel mixtures, and will heat the incoming flow of air excessively. Electronic/ Engine Management On the 4A-GE 20V one particular element, namely the VVT (Variable Valve Timing), has to be controlled by a signal from the ECU. Using a standard computer 16V model however, it is difficult to do. Some installations use the 16V's computer to run the 20V and use the TVIS signal to trigger the VVT. But, because the VVT shuts off to return the cams at high rpm, another "off" position must be re-mapped into the computer. The peak power will not be reached by leaving the VVT in its on position. The fuel map itself is vastly different on the 20V's because of the great differences in the injector size. And more importantly, also because of the huge differences in fuel mixtures needed for 20V's 4 individual throttles as opposed to the 16V's single throttle unit. Additionally, the 20V's ISCV (Idle Speed Control Valve) needs to be controlled by the ECU where as it was controlled by simple cooling system temperature in the 16V. And not having this output on the ECU can prove extremely difficult to get the 20V to idle at all. Most tuners thus, avoid the use of the 16V's ECU for the simple reason that it's fuel map is so far off from the 20V's requirements that it would take too much reprogramming to get it correctly to even make it start. Thus using a full aftermarket unit or OEM for 20V is much more cost effective than to try to devise it based on the 16V ECU. As mentioned earlier, using a DLI system from a 4A-GZE ignition will save the trouble of cutting through the firewall of the AE86. However, none of the distributor-type OEM ignition ECU will be able to send the proper alternating signal to the igniters. The only solution with a OEM ECU will be the use of a 'remapped' 4A-GZE ECU, but this will also be void of VVT signals. Perhaps one of my readers will find a viable ECU to re-map in the coming days. Until then, an aftermarket ECU is the way to go if 20V ECU is not to any avail... Aftermarket ECU seems to be on the list for most home-market conversions. Motec, Tech II, Autronic are the widely used computers which can be adapted for the 20V (though some lack control outputs for the VVT) Some have the ability to memorize more than one map so you can have separate maps for different cams or different engine altogether on the same ECU. I've seen one nice example in Japan which is not marketed in the USA. E&E Systems' Freedom CPU makes a 4A-GE specific computer which can control any model 4A-GE including the 4A-GZE and the 20V, using all of the factory sensors and accessories. (provided it has a Japanese ECU pin socket array). It can memorize 4 individual engine specifications so you can have one setting for street, one for drag, one for track and yet another for smog compliance...or something to that order. The unit is also fully programmable so you can mix and match factory sensors and ignition systems. For example, one can run 4A-GZE DLI ignition on a 20V using pressure sensor from a MAP model 16V. Cool...indeed. Price of this unit is about $1200.00 US so it's very reasonable as well. (more on Freedom in Moto-P's AE86 series) (photo below) Moto-P's AE86 with AE111 20V engine managed by Freedom ECU. Note DLI ignition used from the 7M-GTE controlled by Freedom ECU's DLI outputs. 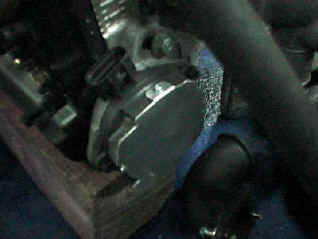 Driveline: Normal configuration AE86 clutch, cover, and flywheel can be used. The bell housing will bolt right on and the T-50 transmission will be mounted just as it was in the 16V setup... Unfortunately the 6 speed transmission of the AE111 is a front wheel drive unit and cannot be used on the AE86. Do NOT forget to install a pilot bearing on the 20V's flywheel as front wheel drive flywheels will be void of this bearing. Exhaust flange for the AE86 header can be modified to fit the 20V. Although port locations are the same, but 2 of the retainer bolt holes need be moved. 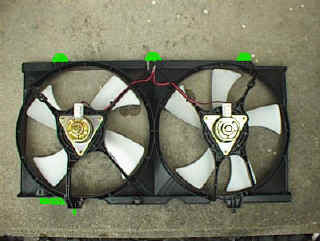 Electric Fan must be installed since there's no provision for engine driven fan on the 20V. AE86's "reserve pressure" oil cooler block should be removed as it's pressure retention spring can drop the oil pressure. Use and aftermarket "positive feed" oil block and larger aftermarket oil cooler for best results. VVT thrives on the high oil pressure to move quickly in and out of position so never do anything to drop the pressure in the 20V.